What is organic pest management? Bugs and insects are a given on any farm. Some bugs are beneficial—they prey on the bad bugs and provide valuable pollination. But other insects pose a threat. Pests can damage the appearance of fruits and vegetables, making those products difficult or impossible to sell. Even worse, some pest damage can kill a crop outright. Conventional farmers spray toxic pesticides to eliminate pests. Organic farmers use alternative strategies to reduce and control pests without the use of synthetic inputs. 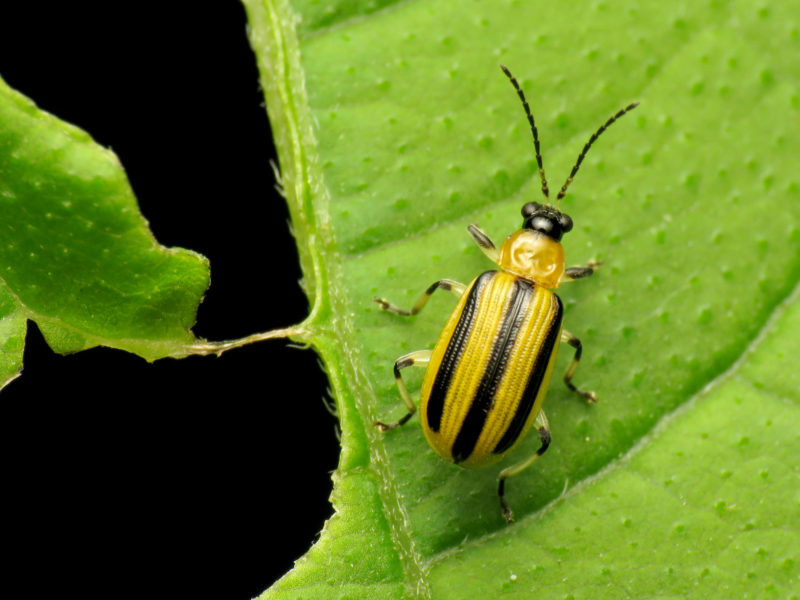 The striped cucumber beetle can wipe out an entire crop. Photo by Katja Shulz. The first line of defense is prevention. Healthy soil creates strong plants that are resilient to pest pressure. 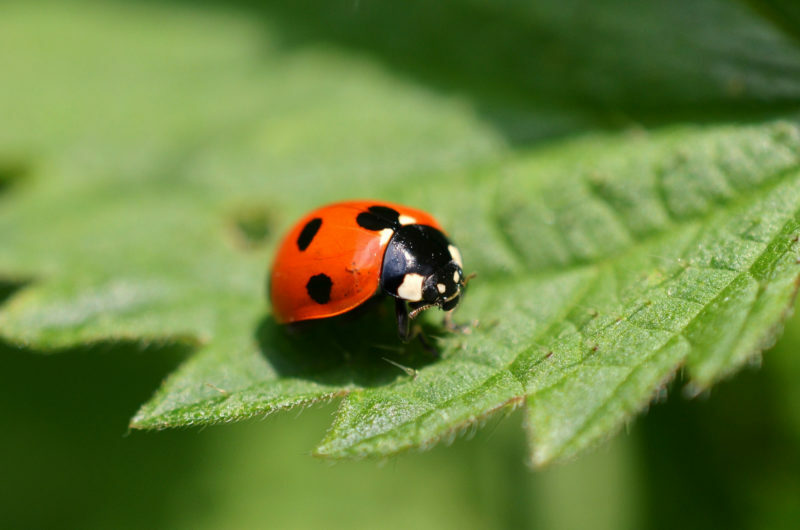 Farmers can encourage populations of natural predators and beneficial insects, like ladybugs. Other strategies include rotating crops and selecting pest-resistant varieties of crops. 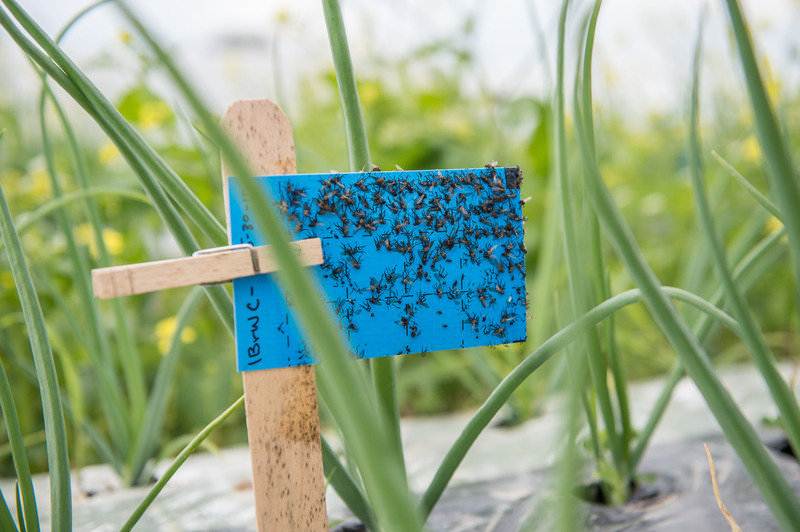 When pests become a more serious problem, organic farmers might use pheromones to disturb pest mating cycles, or mechanical controls like trapping. When all other methods have been exhausted and a farmer is faced with a potential significant loss, targeted sprays of organic-approved pesticides may be used. Broad sprays of non-specific pesticides are always a last resort. Beneficial insects help control populations of unwanted pests. Photo by Thomas Wood. Chemical pesticides pollute our air and water. They kill good bugs and insects, too, destroying biodiversity in a way that has a ripple effect on ecosystems throughout the farm. Organic pest management is a holistic approach. Organic farmers implement many strategies, including those detailed above, to reduce the use and consequences of chemical pesticides and promote a farm system that works in harmony with nature. The result is reduced cost, stronger plants, healthier wildlife, and a cleaner environment for everyone. Our scientists are constantly looking for new ways to help farmers reduce pest pressure organically.